Activa Well Being Vitality – Recharge your batteries! Feeling good should not be an option. 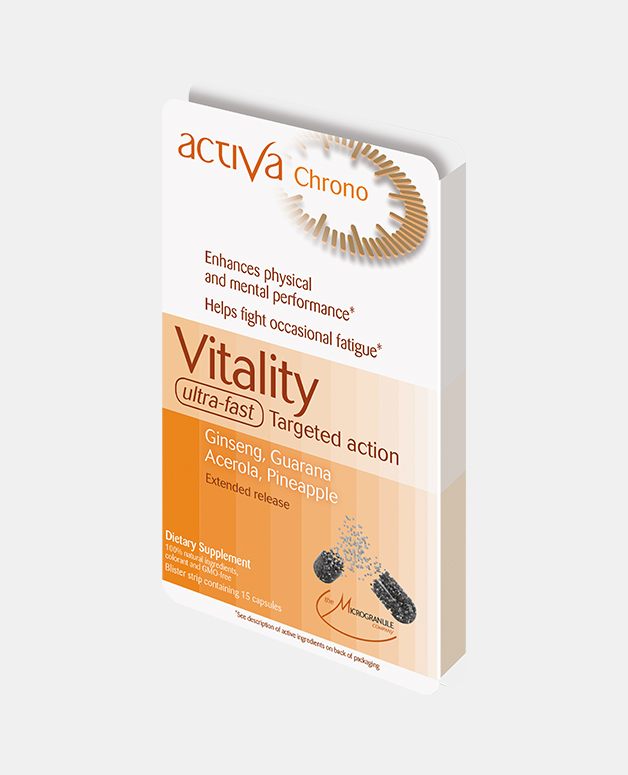 Recharge your batteries with Activa Well Being Vitality to restore your vitality. 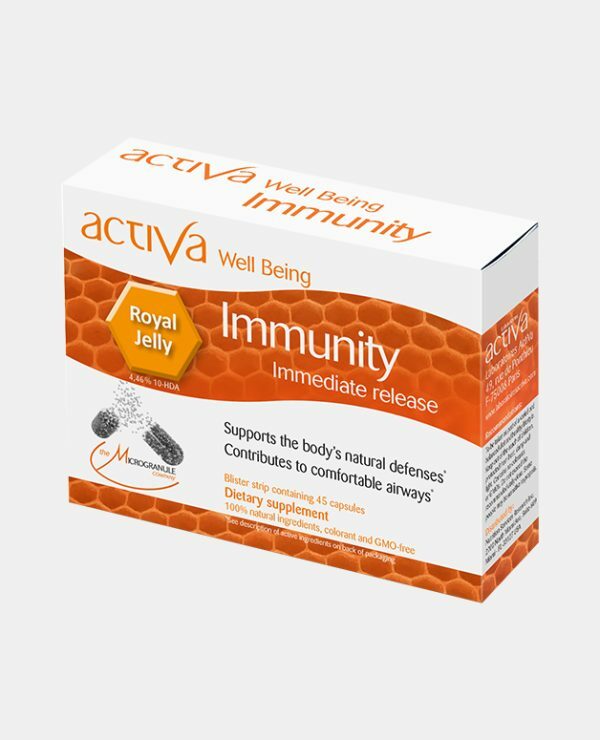 Activa Well Being Vitality helps fight against physical and intellectual fatigue while avoiding hyper excitability, fight occasional fatigue. Strengthen your gastrointestinal flora with 12 billion gastro-protected probiotics. Protecting and maintaining your intestinal flora is essential to your well being and immunity protection. 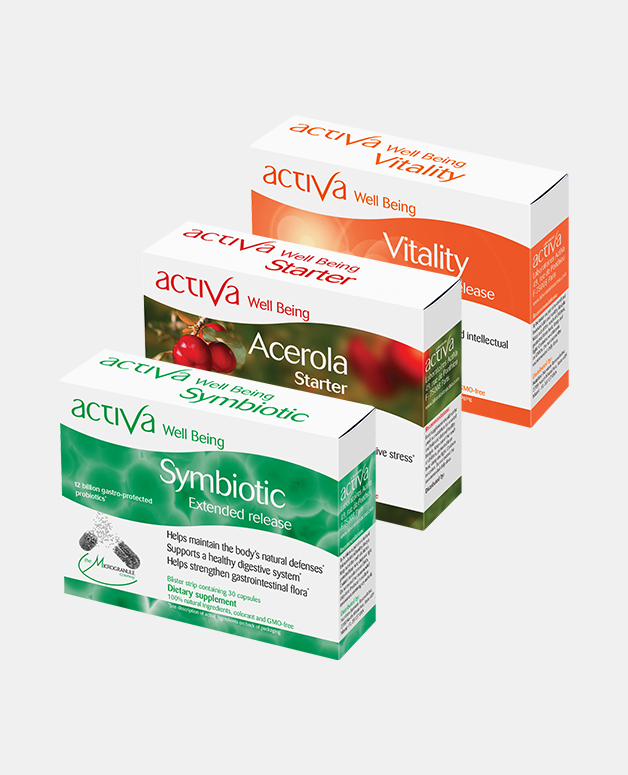 Activa Well Being Symbiotic is a synergistic blend of 4 probiotics together with 2 kinds prebiotics for optimal efficiency. Probiotics: Bifidobacterium longum,Bifidobacterium Ingantis, Lactobacillus Acidophillus and Lactobacillus Rhamnosus are living & “friendly” microorganisms that live in the guts and keep the intestinal flora alive. It supports bowel balance and helps the body fight harmful side effects of other treatments (antibiotics). Prebiotics: Fructo-oligosaccharies (or F.O.S.) supports a healthy “environment” of the colon for “probiotic” to develop and sustain. 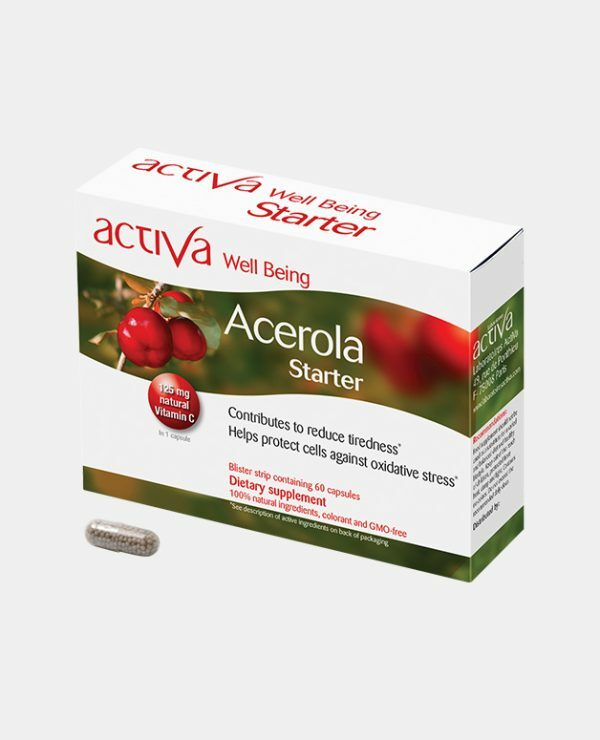 Acerola, a natural Vitamin C contributing to a normal immunity, helping to reduce fatigue and promoting the protection of cells against oxidative stress. Acerola pulp contains 50 to 80 times more vitamin C than an orange. It is the richest natural source of Vitamin. It is an essential element for the body to function properly. Our Acerola is associated with Camu-Camu, allowing a better concentration of the active ingredients for your body and a greater well being. Vitamin C plays a determining role of the constitution of the bone tissue, skin, hair and nails and is very important for the organism’s immunity. 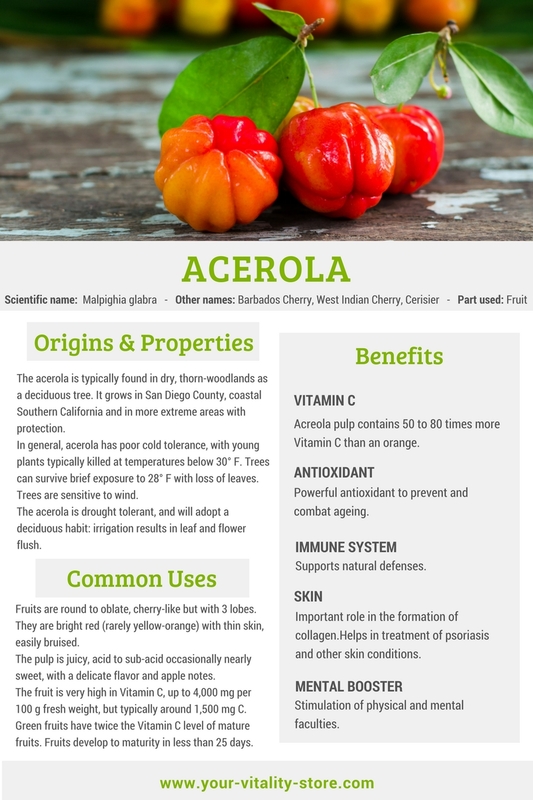 Acerola: It is a fruit (small cherry) from Porto Rico. It has the highest concentration of Vitamin C in the world (50 to 80 times more than in oranges). Acerola also contains minerals and bioflavonoids (anti-oxidants) and isoflavones. Full ingredients list: Bulking agent xylitol, vegetal gelatine capsule. To be taken as part of a balanced and varied diet combined with a healthy lifestyle. Keep out of the reach of children, protected from heat, damp and light. These statements have not been evaluated by the Food and Drug Administration. This product is not intended to diagnose, treat, cure or prevent any disease. It is necessary to consult your medical practitioner to evaluate your health condition and requirements. Activa Well Being Vitality is not recommended for children under 12 years old, pregnant women and breast-feeding mothers.